A bomb scare in the district court complex here today caused panic among hundreds of litigants, lawyers, judicial staff and officers. Today’s meeting of the municipal corporation's house to discuss a proposal to build bridges on the Budha Nalah, Rahon Road, Vivek Nagar, near Dhobi Ghat, Kapil Park and GT Road near old Chand Cinema took a contentious turn after several Congress party councillors sat on a ‘dharna’ (sit-in) on the floor disrupting the proceedings. A man who masqueraded as a “middleman” of a bank defrauded hundreds of city residents of lakhs of rupees on the pretext of providing them personal and house loans on easy installments. The fraudster even put out advertisements in some leading vernacular newspapers promising to provide easy financing to residents. 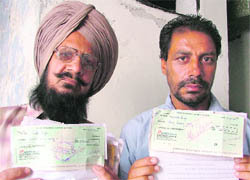 Sadhu Singh and Varinder Singh who were cheated by a conman posing to be a middleman of a bank. Dog scare has gripped students of Smt Krishna Devi Memorial High School, New Kundan Puri, after stray dogs bit the principal and a peon.Frightened by stray dogs, the students have stopped coming to school. Those coming to school on foot are the most frightened ones, as they are more prone to attacks by dogs. Though the school is closed due to summer vacation, extra classes are being held in the school. Acknowledging the fact that blood donation was a noble contribution towards ailing humanity, cops of Ludhiana (rural) district vowed to spread awareness about blood donation among masses.An oath was taken in response to the call made by SSP Harinder Singh Chahal on the occasion of the World Blood Donation Day yesterday. LUDHIANA : A puppet show was organised by Maple Bear Pre-School during the save earth summer camp-2010 held on its premises. Over 100 kids participated in the camp. The Bharti Kisan Union (BKU) has taken umbrage over the issuance of power and canal water bills to farmers by the state government while the air over productivity bonus is still to be cleared. Dr Jeyaraj Durai Pandian, professor of neurology and stroke specialist at Christian Medical College and Hospital (CMCH) here, gave an invited talk in the recently concluded European Stroke Congress at Barcelona in Spain. He spoke on “stroke prevention strategies in low and middle income countries”. Girls have once again made a clean sweep in the PSEB Class X results. Besides the top slot being bagged by Shilpa Garg of BCM School, out of the rest nine top positions, as many as six have gone to girls. Nine councillors of the nagar panchayat, Khamano, yesterday submitted a memorandum to SDM Khamano Inderjit Kaur Kang regarding the delay in de-notification against the panchayat president. Inderjit (10) was electrocuted in his house at Ravidasspura last night. He was playing on the roof when he suddenly touched live high tension wires. He was brought to the Phillaur Civil Hospital, where he was declared brought dead. Members of various social and youth organisations, including Kaarkhana Mazdoor Union, Lok Morcha, Punjab, and Moulder and Steel Workers’ Unions, today held a protest rally outside the Ludhiana Deputy Commissioner’s office demanding capital punishment for the accused of the Bhopal gas tragedy. A pesticide-producing factory, Modern Pesticide Limited situated at the Lakhowal road, Kohara, was gutted in a fire caused due to a short circuit early in the morning at about 7 am. Members of Shri Sanatan Dharam Mahaveer Dal of Fatehgarh Sahib and Patiala districts at a meeting presided over by Raj Kumar Singla Patran elected its office-bearers. LUDHIANA : Specially targeted at semi-urban population, Bharat Box Factory (BBF) Industries Limited launched a detergent powder, KIXO. Anti-dust agents in the detergent will make sure that the dust does not cling to the cloth. A kabaddi player, who represented the kabaddi team of Italy during the Kabaddi World Cup, was shot at following a heated argument at Seerah village here this afternoon. The police today arrested a man for stealing two kilograms of gold ornaments and Rs lakh in cash from a house in Kucha Baile Ram in Purana Bazar. The suspect, identified as Varun Khanna, a resident of Shivpuri, committed the thief at his father-in-law’s home while the latter, Bhushan Dhall, a noted industrialist in the city, was away. According to the cops, Varun along with his brother Gaurav Khanna hatched the conspiracy a few weeks ago. The Khanna police today arrested four persons for snatching a bag of money from a bus conductor deployed with the Chandigarh Transport Undertaking (CTU). 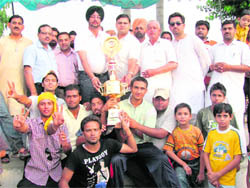 Patiala emerged victorious after defeating Ludhiana on the basis of the first innings lead of 117 runs during the Punjab State Inter-District U-19 Cricket Tournament for the Dhruv Pandove Trophy being organised by the Punjab Cricket Association at the Dhruv Pandove Cricket Stadium, Patiala, today. The Ahmedgarh Sports Club and Malerkotla Cricket Club emerged winners and runners-up, respectively, in the Rajiv Sanjiv Memorial Cricket Tournament that concluded at MGMN Senior Secondary School here yesterday.